Over the past decade or so, the way in which we consume football has changed thanks, in part, to a rise in social media use that has helped to feed our ever growing appetite for the latest football news and gossip. The likes of Twitter and Facebook offer clubs and other media outlets a platform to provide up to the minute, minute-by-the-minute news on our favourite clubs. According to EU data, Hungary has the highest social network usage in the EU with Facebook being the most popular platform on which to connect. While Hungarian clubs may no longer rank amongst the biggest in Europe, they are – slowly – catching on to the use of social media as a means of engaging with fans, local and global, with most clubs now having a social media presence. 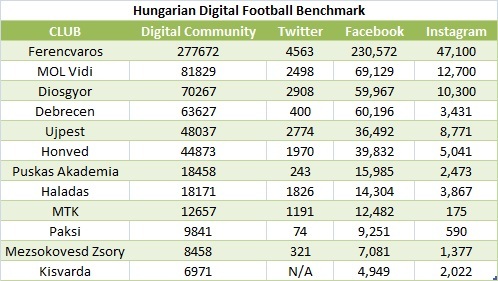 The Hungarian Digital Benchmark Report aims to gauge the performance of the current NB1 clubs on their digital presence. The report focuses on Twitter, Facebook, and Instagram, and provide some insights into who is leading the Digital game in Hungary. It will come as a surprise to few to see Ferencvaros lead the way in terms of number of online followers with a combined following of 277,672 (as at 31st December, 2018). So great is Ferencvaros’ oonline following that is greater than the cumulative total of the next four clubs – Vidi, Diosgyor, Debrecen, and Ujpest. Despite Ferencvaros dwarfing the local competition, their Digital Community pales into insignificance when placed on a global picture. Toulouse, ranked 198th in Digital Sports Media’s Global Digital Football Benchmark (Summer 2018 Edition), recorded over 1 million Digital followers, nearly four times that of Fradi. However, this figure includes circa 147,000 followers of platforms not included in the Hungarian Digital Football Benchmark. 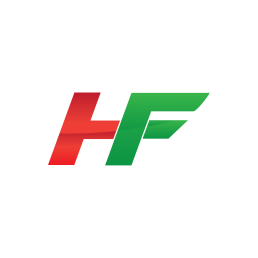 Still, it highlights that there is work to be done to improve the online visibility of Hungarian football. In line with the data reported by the EU, Facebook is the platform where most fans connect with Hungarian clubs. The majority following of all 12 NB1 clubs Digital Community comes via Facebook, followed by Instagram for all clubs except MTK. Twitter is currently the least popular platform on which to connect; Paksi have less than 100 followers on Twitter and Kisvarda have yet to set up an account and join the Twitter revolution, further promoting the case that more needs to be done in developing this area of the game in Hungary. 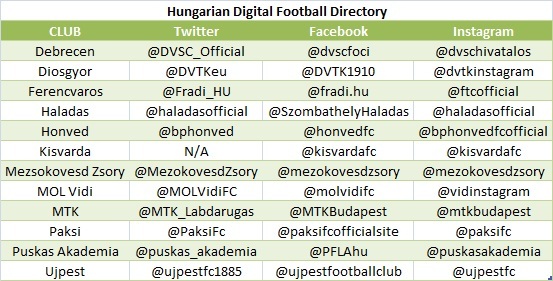 At present, only MOL Vidi have an English language social media platform – follower numbers not included in this report – which identifies a further area of potential growth for Hungarian football clubs online presence. All follower numbers correct as of 31st December, 2018.